Glenn Close. Photo by Joan Marcus. Glenn Close is this generation’s Shirley Jones. Both have become famous by creating signature roles across film, television and the stage for decades. But where Ms. Jones is the embodiment of wholesomeness, from Marian the Librarian through Mrs. Partridge, Ms. Close will best be remembered for her dark side. 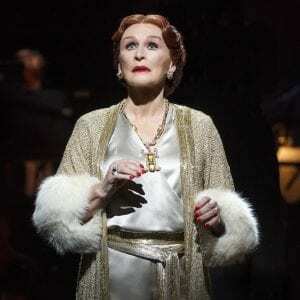 From her bunny boiling in Fatal Attraction to her cold blooded Patty Hewes on Damages to her current role as the hopelessly delusional Norma Desmond in this spitfire revival of Sunset Boulevard, she has mastered the art of bringing controlled madness to her method. Of all the big names attached to this production, the most important is Billy Wilder. The 1950 film which he co-wrote and directed is so chock full of bullet-proof source material – weird characters, classic lines, unforgettable freeze frames – it is impossible not to be entertained by any decent adaptation. Thus, we are given Norma, the rich and famous silent movie queen, now friendless and lost in her own dreams of grandeur, when not mourning the loss of her pet chimpanzee. And there is Max (Fred Johanson) her faithful, Germanic man servant who harbors enough suppressed emotions to deserve a musical of his own. And there is Joe (Michael Xavier), the struggling screenwriter with some serious self-esteem issues who stumbles into Norma’s life, becomes her new trained chimp for all intents and purposes, and milks it for all he can. An early, defining moment in the story has Joe saying to Norma, “You used to be big,” to which she famously responds, “I am big. It’s the pictures that got small.” But, unlike Gloria Swanson in the film, Ms. Close, under the clever direction of Lonny Price, is smaller than life. She might think of herself as huge, but her many costumes (beautiful and crazy, as designed by Tracy Christensen) overwhelm her, as does the towering proscenium of the ornate Palace Theater. With her petite, 5’5” frame, Ms. Close waddles more than she struts. Her Norma is not a crazed monster, she’s a wilted Blanche DuBois bereft of the kindness of strangers. 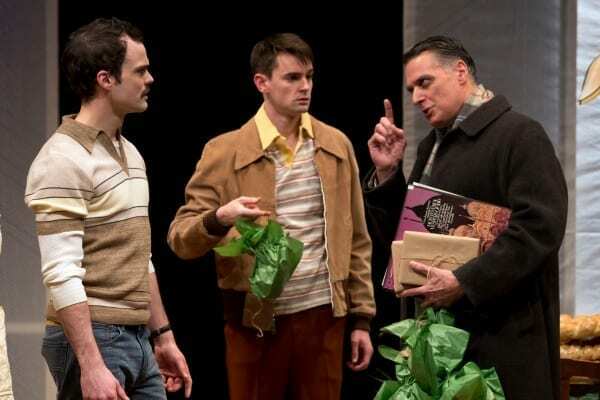 Mr. Johanson is fabulous as Max, with his deep voice miraculously ranging into falsetto territory as he sings the affectionate ode to his boss, “The Greatest Star of All.” As Joe, Mr. Xavier has the hardest role and is the show’s weakest link. He serves as narrator while simultaneously submitting to Norma and wooing the much more age-appropriate Betty (the thoroughly charming Siobhan Dillon). But, lacking the necessary stage presence, he comes across as your average nice guy who can carry a tune respectably. His Joe reminded me a lot of Sid, the good guy love interest in a different musical, The Pajama Game. Turns out Mr. Xavier indeed played Sid on the West End in 2014. The 1994 original Broadway production of Sunset was mocked for its extravagant set design and I can certainly understand the impulse to go big here. But this production team goes minimal, mostly relying on a framework of stairs and platforms, with the occasional black and white film projection. There are no opulent mansion walls. Instead, we get something much better: a 40 piece on-stage orchestra giving glorious voice to Andrew Lloyd Webber’s score. Norma was not the only diminished grand dame to be found on the night I attended. Five minutes before curtain, Hillary Clinton swept into the theater and was met with a standing ovation. Her presence resulted in a magical moment. During the show-stopping applause for Ms. Close after she delivered her knockout rendition of “As if We Never Said Goodbye,” (where the spotlight finds Norma and she blossoms like a sun starved Lily), there was a palpable feeling of the applause shifting toward Ms. Clinton, if just for a moment, as lyrics like “So watch me fly, we all know I can do it” reverberated in our collective consciousness. One could not help but think that if only Norma had had an email server and Hillary had not, they both would have been much happier. Sunset Boulevard – Music by Andrew Lloyd Webber; Book and lyrics by Don Black and Christopher Hampton, based on the Billy Wilder film; Directed by Lonny Price. WITH: Glenn Close (Norma Desmond), Michael Xavier (Joe Gillis), Siobhan Dillon (Betty Schaefer), Fred Johanson (Max Von Meyerling), Nancy Anderson, Mackenzie Bell, Preston Truman Boyd, Barry Busby, Britney Coleman, Julian Decker, Anissa Felix, Drew Foster, David Hess, Brittney Johnson, Katie Ladner, Stephanie Martignetti, Lauralyn McClelland, T. Oliver Reid, Lance Roberts, Stephanie Rothenberg, Graham Rowat, Paul Schoeffler, Andy Taylor, Sean Thompson, Matt Wall, and Jim Walton. Choreographed by Stephen Mear; Scenic Design by James Noone; Costume Design by Tracy Christensen; Lighting Design by Mark Henderson; Sound Design by Mick Potter; Makeup Design by Dave Bova and J. Jared Janas; Production Stage Manager: Timothy R. Semon; Stage Manager: Matthew Lacey; Musical Supervision and Direction: Kristen Blodgette; Musical Coordinator: David Lai. At the Palace Theatre, 1564 Broadway, 877-250-2929, http://sunsetboulevardthemusical.com. Through June 25. Running time: 2 hours 30 min.